This was kind of impromptu review. 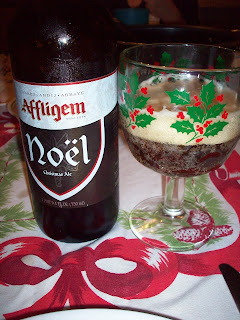 We ended up opening a bottle of Affligem Noel at dinner and I thought I would seize the opportunity to do another review. I snapped a few pictures at the table, much to the dismay of my better half. I did however wait until after I left the table to write some stuff down. I still have a good portion left in the glass to review. It pours a nice dark amber almost brown, with reddish hues. It is bottle conditioned so it is a little cloudy. It also has a very rich off white head. The first thing on the nose is the Belgian yeasty aromas. There are also sweet almost roasted malts and those sweet fruity esters and volatiles escaping from the glass. Sweet, smooth, rich and creamy, that about sums up the first sip. Sweet roasted malts upfront, then a nice carbonation but without the usually cleansing instead more malty sweetness and you start to pick up the complexity of fruity esters with a yeasty background. Just when you are ready to expect a hop dryness the finish is not hoppy at all. In the finish you experience some spicy flavors and the alcohol seems to supply the drying effect. The alcohol is very well masked in this beer. You really cannot detect it at all. This beer is sweet malty goodness to the very end. I know there are hops in there but it’s just enough to dry the finish a little with no bitterness at all. I forgot to talk about the head on this beer. It was just incredible; thick and rich up front and a nice protective coating stayed with the ale to the bottom of the glass. Well the glass is empty now. I guess I’ll have to stop this here. I’m sure that I will have this again this season so I may update this post then. This was the first time I ever had this bier. I was a little surprised; I really did not expect it to taste this good. 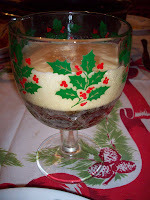 It’s not up there with Corsendonk or St. Bernadus Christmas ales but it was pretty darn good. And for the price it is one I will definitely pick up again this season. A solid B+ for a Belgian Christmas Ale.